To some he’s a punch line, Barney the dinosaur by another name. To others, he’s a cherished symbol of spectacle on a budget. But to me, and countless others, he’ll always be far more. Godzilla, that tortured titan of the nuclear age, started as a serious and deeply unsettling reaction to the fears of a nation that sees god in all things. They say that he’s immortal; he shrugs off missiles, gas, and sixty years in a changing world. Godzilla has endured because he is a symbol, and a changing one, for his nation and the world. 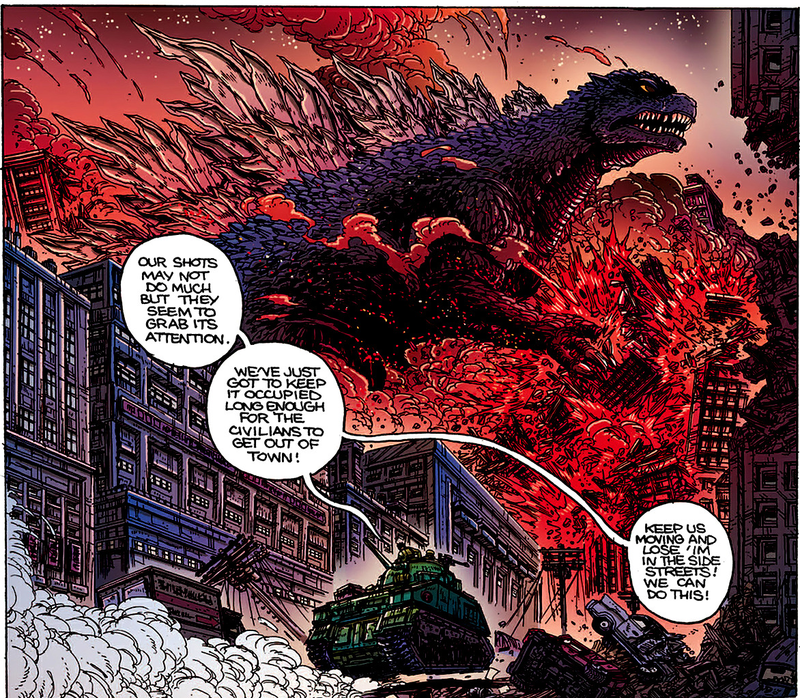 With this in mind, and a clear love of the character in his heart, James Stokoe has given Godzilla another playground. And, lucky us, we get to watch – and without hazmat suits, no less! Godzilla: The Half Century War follows a young enlistee in the Japan Self-Defense Forces by the name of Ota Murakami over the course of his fifty year obsession with Godzilla. Unlike many attempts to write a new story for the King of the Monsters, Murakami is neither brushed off in favor of giving Godzilla his screen time, nor over-analyzed in an attempt to give the series legitimacy. He’s a simple character, but one that breathes. 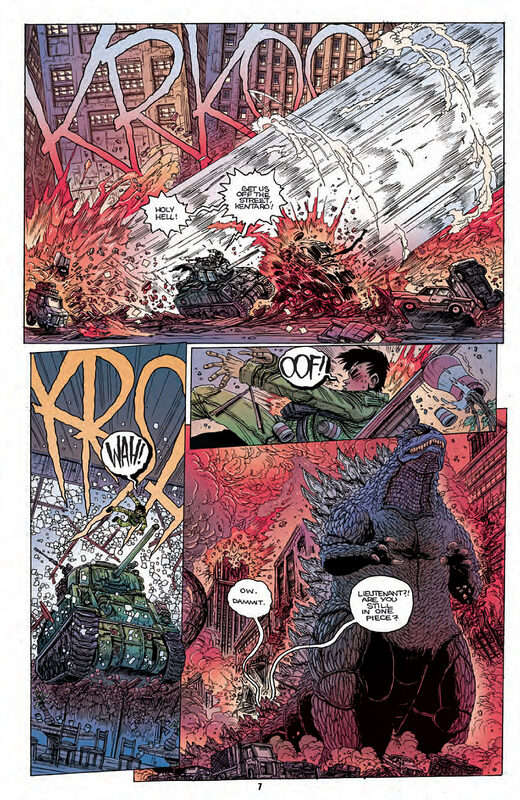 Stokoe cleverly draws on each of Godzilla’s three eras, adding just enough of his own ideas, to create an alternate history that feels vivid and arresting. One of the most interesting little mysteries of the title is the subtle parallelism between the evolution of the fight against the monsters and human warfare. 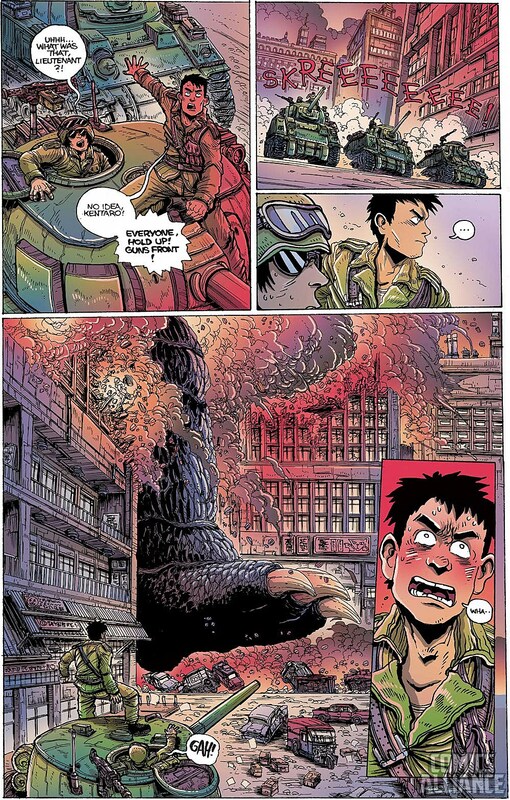 If there’s a single moral to be gleaned from this theme, other than that even Godzilla isn’t enough to show us the folly of war, I honestly haven’t yet pieced it together, but it shows the care and attention that Stokoe has put into the story and the delicate work of building his world. 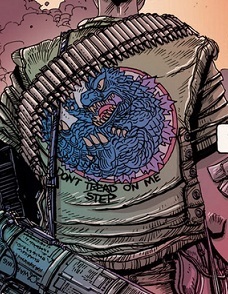 Issue #1 gives us an interesting retelling of the original Godzilla, from the perspective of the JSDF. It’s respectful of the film, but manages to make its own statement about war and heroism, potentially a much darker one. From there, however, the series ventures into its own dimension of alternate history and monster warfare. The highlight is definitely issue #3. Set in Ghana, it explains the primary plot of the series and shows us the full extent to which our world is inhabited by monsters. It’s the last time the series feels young, populated by a who’s who of classic Showa era titans and the teams assembled to deal with them. There will be bigger threats in the following issues, but never more. 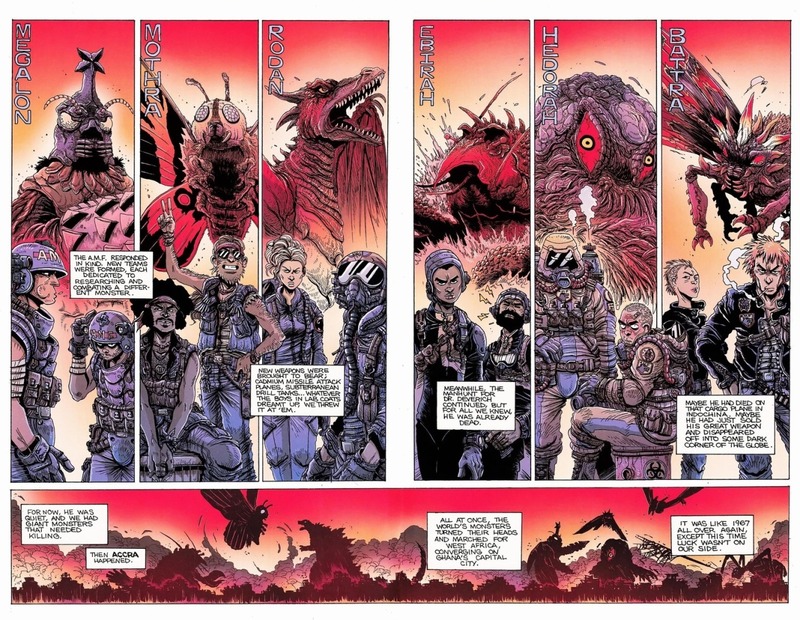 For all the fun that Stokoe brings to the plot, the real story for many is his artwork. Flip to a random page and you’ll know that this book is visually amazing. Slathered in rich colors and absolutely insistent on wringing every drop of personality out of the premise, Stokoe’s art is something special. Perhaps the most impressive aspect of the artwork is its scale. Much as he was when many of us first saw him, Godzilla, for all his size and power, is only a few inches tall in this story, unable to break the limits of the paper. 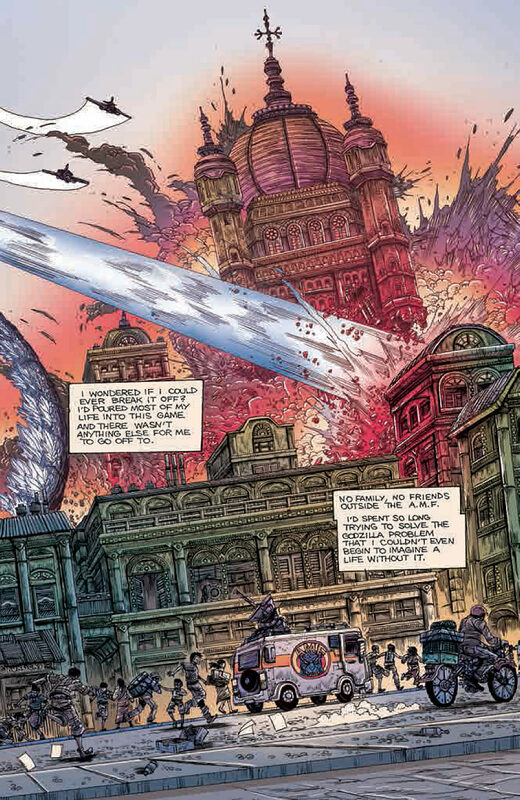 That means that, like the artists at Toho, Stokoe’s power come not from the massive, but from the minuscule. In every panel of this comic, Stokoe draws down to the tiniest detail. From the scales on Godzilla’s belly to the flaming leaves of a Vietnamese forest, there’s beautiful artwork from the top to the bottom. The monsters all look great, with perhaps the sole exception of personal favorite Rodan, who resembles his substandard trendmaster incarnation. Godzilla is heavily inspired by the Millenium era designs. Though I prefer the sleeker Heisei look for the monster king, it’s hard to deny that the jagged spines and heavy scales suit Stokoe’s style brilliantly. The greater mass of the Millenium look also does a lot to give the comic its impressive sense of weight and power. 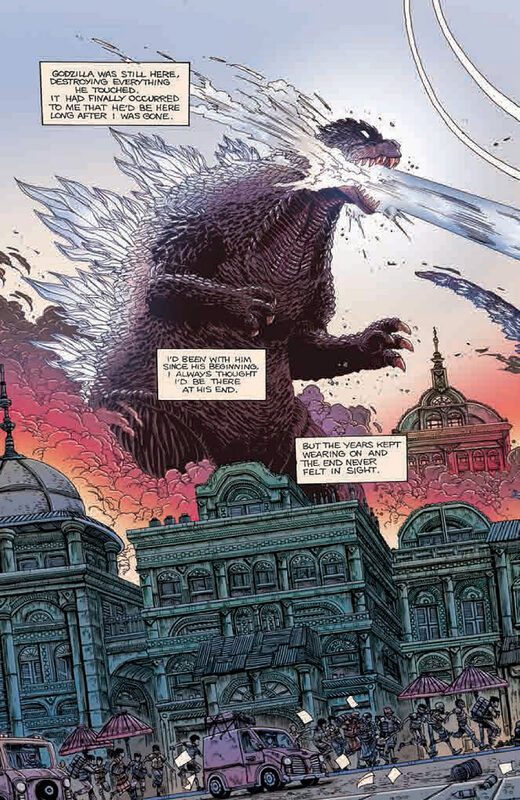 Rarely, I admit, this goes too far and leaves Godzilla looking like the man in a suit that he usually is, but Stokoe shows great skill in framing Godzilla and giving us some pretty amazing panels. 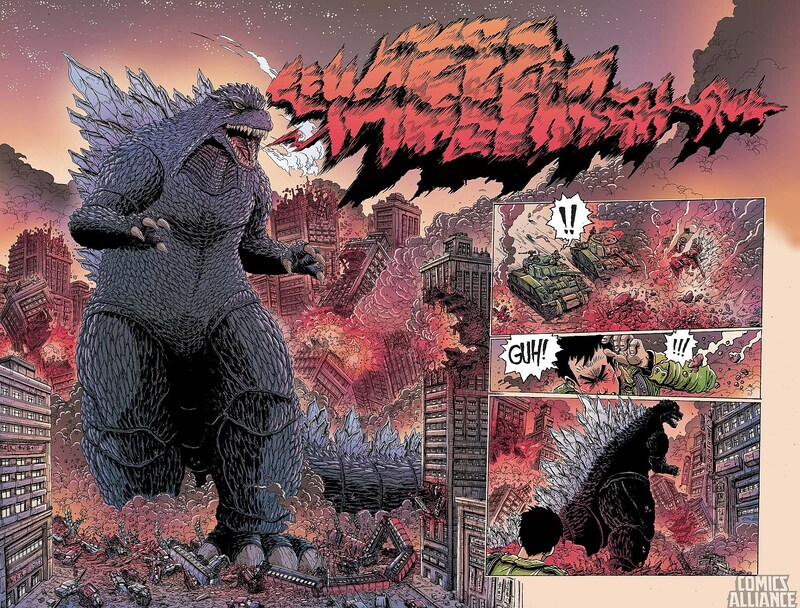 There’s one particular panel in issue #1 of Godzilla advancing through Tokyo, head down, arms in front, that really feels like it channels the essential Godzilla. I won’t spoil who else comes to the party, but Stokoe renders them brilliantly and with loving, but never slavish, devotion to the films they starred in. The humans are also wonderful to look at. If you had any illusions that such detail work would be reserved for the kaiju, allow me to shatter them now. By the time this fifty year crusade is over, Ota is nearly as craggy as the monstrous lizard he’s been chasing. Each of the characters is wonderfully designed, in that delightfully underused way that tells you half of what you need to know in a glance. As if that weren’t enough, Stokoe goes to great lengths to get their emotions across through their faces, making nearly every panel a strong example of simple effective storytelling. The one caveat with the art is that, while the exaggerated expressions are great in moments of comedy, they sometimes undercut the horror of the book. 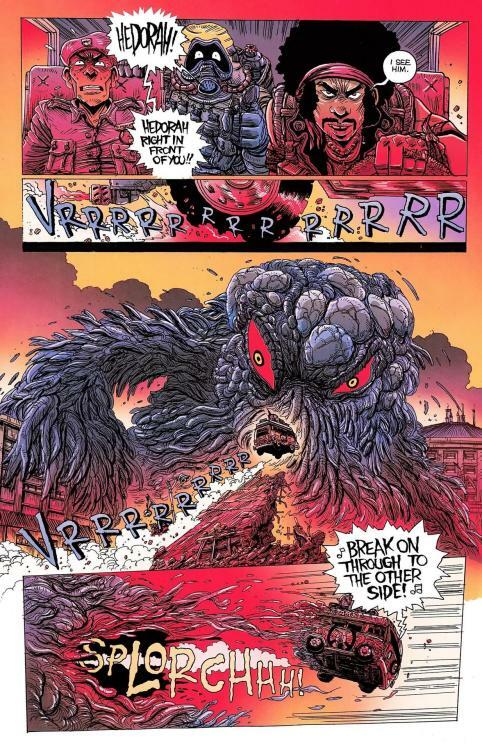 Gojira, after all, is a horror film, and panels like Murakami’s first reaction to Godzilla come off a little too funny. Still, this book is a little too fast-paced to really channel the terrifying ideas of the original film, so it’s not a crippling problem. The layouts are varied, the detail work extraordinary, and the colors like a punch to the face (in the best possible way). Godzilla has always been a work of spectacle, but rarely has he been rendered so well on paper. 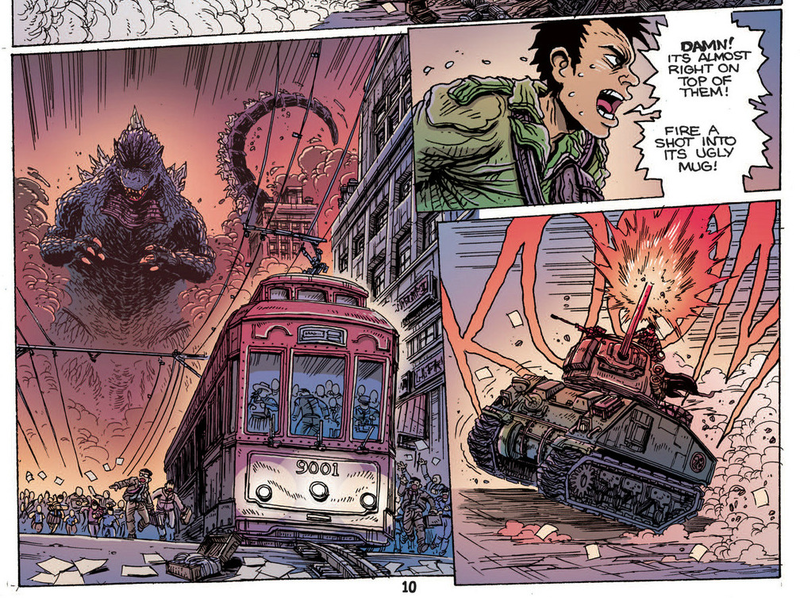 Stokoe’s personal style molds to the Daikaiju genre with ease and makes for a comic that will not soon be forgotten. A shame the man can’t make posters of this…. The technical quality of the writing is solid, if not brilliant, though it’s much better than what people would normally associate with Godzilla. The characters have their own voices and Murakami’s narration has an appropriately world-weary character about it. At times the relative simplicity of much of the dialogue is actually a positive, highlighting Ota’s musings and granting them an inherent narrative punch. Though there is some undisguised exposition, and use of simple tropes, the story is presented with the exactly the complexity it requires. When the book needs a better quality of writing, it gets it. Consider the introduction of Doc Randal or Dr. Deverich’s deal in issue #4, for instance. Half Century War takes the route of self-knowledge, rather than that of ambition, which actually leads to my greatest issue with the series. While the five different eras are a brilliant narrative device for an excellent mini-series, the biggest flaw with Godzilla: The Half Century War is its length. James Stokoe has stumbled onto something really special here. Possibly excepting issue #1, each issue of The Half Century war could have supported its own miniseries. In a book this vital and full of characters, it’s almost a crime to limit each era (and many of its characters with it) to a single issue. I mean seriously, that thirteen year gap between issues 4 and 5 could easily have been the setting for an ongoing series, and are you really going to tell me that you wouldn’t throw down money every month for a mini-series about the monster response teams from issue #3? 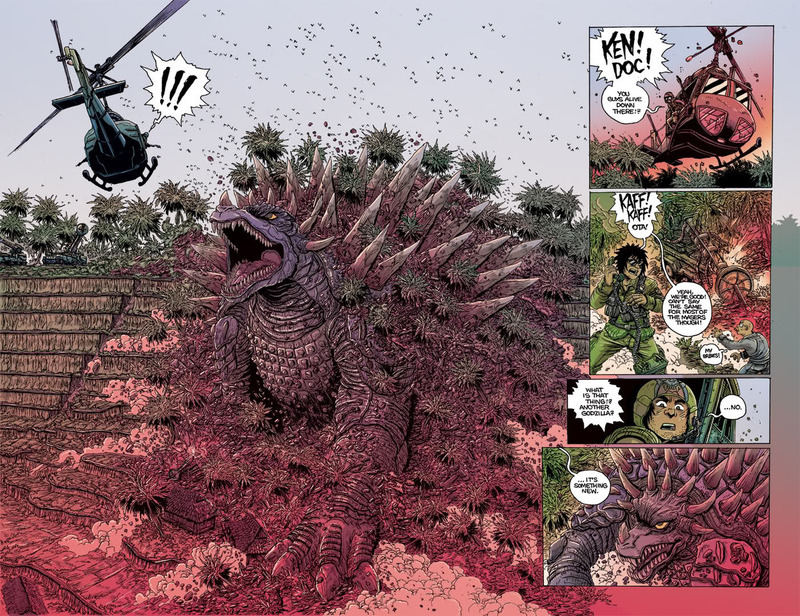 Stokoe’s filled his world with clever nods to Godzilla history and subtle hints to a world trying to carry on while monsters wander its all-too-tiny boarders. What goes on inside the A.M.F. Command? How does the Yakuza feel about this? Did Godzilla alter the outcome of the Vietnam War? Stokoe probably has an opinion on all of these things, but they never matured into full, written out ideas. And it’s not just the what-ifs. While it certainly bugs me that I’ll likely never know more about this fascinating world, it’s equally annoying to feel the page constraints dictating the story on subsequent read-throughs. It just feels like the series was rushed by the need to stay within its own bindings. I certainly understand that this must have been an intense ordeal for James Stokoe; that writing, drawing, coloring, and lettering this behemoth of a mini-series must have been taxing in the extreme. What’s more I’m shocked and awed by his ability to put this series out without delay. All the same, I think that each era deserved more than twenty-two pages, and that the series could have easily supported more than five eras. If there’s anything else that bothers me about the series, it’s that we don’t really get to know the monsters at all. Talk to any serious fan of Daikaiju Eiga and you’ll probably find that they know these monsters in a way that seems nearly magical. I’m a huge fan of Rodan and I’ve actually seen every movie that he’s appeared in, but I still don’t know where the samurai warrior persona that many attribute to him comes from. The only instance of Rodan showing complex emotion that I can remember is him basically acting like a troll in Ghidorah the Three Headed Monster. On the other hand, Gigan’s habit of using his allies to cover his retreat made him an instant favorite. The point is that fans have developed connections to these characters based on the films, rumors, and popular theory. Unfortunately not even Godzilla gets much of a chance to show us who he is. The more villainous kaiju in the series have a certain level of malice in them but, particularly with the care he took in showing us the human’s emotions it would have been nice to feel a little more from the kaiju. Then again I just complained that we barely get to know most of the human characters so I suppose my point about needing more of this stands. 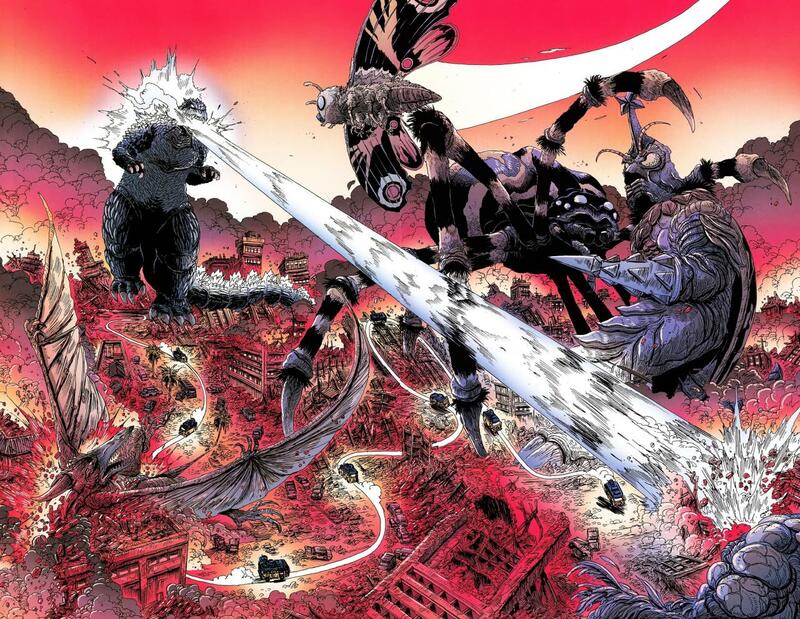 Godzilla: The Half Century War is not a comic of such brilliance that it will convince anyone to love the big G. That said, it’s a glorious piece of sequential art that serves as a celebration of all things fun within the Godzilla franchise. It may lack the seriousness of Godzilla’s headier outings, but it’s Godzilla Raids Again with better plotting, Godzilla vs. Gigan with stronger characters, and an honest match for Destroy All Monsters on nearly every level. Godzilla’s been with us for nearly sixty years. Stokoe leverages the sheer power of his longevity into a beautiful look at war, monsters, and legacy that simply stuns the senses. It’s that rare book that could be better but doesn’t have anything wrong with it. It’s possible that these improvements could have come with an increased scope for the series, but I’ve found that if your complaint is ‘there’s not enough,’ someone’s done something right. If any part of you enjoys Daikaiju Eiga, James Stokoe has given you a gift. 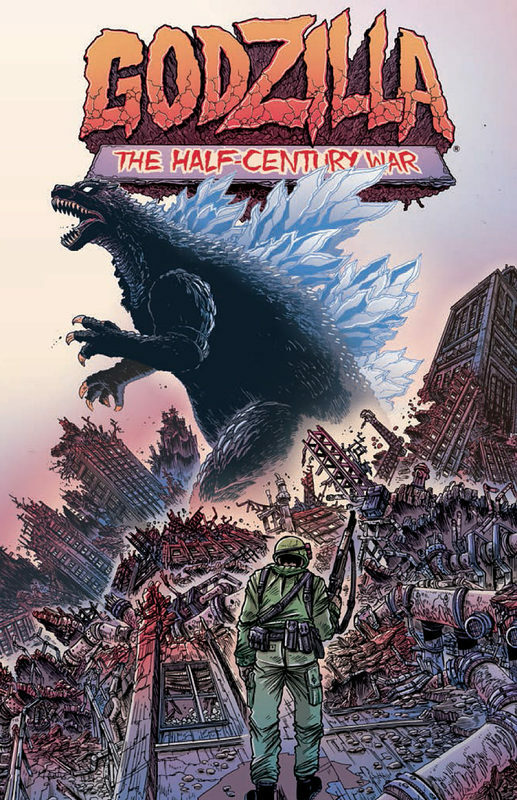 Godzilla: The Half Century War is available now in trade for $20.00 and both the collection and the individual issues should be fairly easy to find or order at your Local Comic Shop. I was wondering if this trade was worth a shot. I’m glad to see it does. Thanks for the elaborate review.